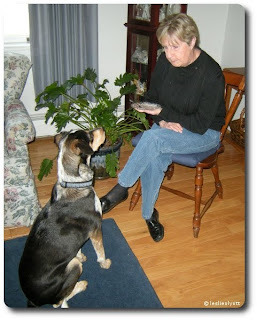 Newly armed with information gleaned from reading every book recommended on Debbie Jacob's fearfuldogs.com website, we were beginning to understand the impact of Bella never having been properly socialized. Bella didn't know how to react to other dogs when she was on a leash and, as previously noted, she usually reacted badly. As suggested in the readings, I thought we had a wonderful opportunity to help build Bella's confidence and social skills at the same time by taking her to an 'obedience' class. I already know sit = treats. Too old for most Puppy Kindergarten classes and certainly not ready for the advanced classes of older dogs, a little research led us to a "Beginner Obedience" class for slightly older puppies who just needed some "assistance" in the obedience department. Obedience wasn't specifically the goal, socialization in a safe, controlled atmosphere was but getting both Jan and I on the same training page could only be a plus. A note before we get to the actual class to set the stage for our state of mind walking into the training center: Bella was born essentially wild and had to hunt to eat for the first few months of her life. She was very, very good at "hunting" slugs, a bit less so at hunting creatures that can actually move faster than the literal "snail's pace" but she was always, always up for the game. a teeny, tiny Toy Poodle whose name I can't remember so we'll just call him "Lunch". Bella's idea of "loose-leash walking"
Our classmates learned more than they ever wanted to know about approaching and working with fearful dogs: how tossing her treats was a good way for her to begin associating people (strangers) with all good things, how to position ourselves between Bella and the fear-inducing item and use high-value treats to bring her attention back to us. We learned that keeping dogs moving can keep their attention off each other and so spent a lot of time walking the dogs around the room. Near the end of the class, we got to try our hand at some agility obstacles where Bella managed to demonstrate her intelligence once again as she continually out-foxed us with the tunnel. She did go through it once but Bella is particularly wary of barrels so we never really expected her to go through one lying on its side. We were proud of her for trying but never forced her to go closer than she was comfortable doing on her own. She showed such enthusiasm for the jumps and weave poles, however, that we have recently started her in an "Agility for Reactive Dogs" class. She's going to be amazing! This sounds like a great class. I love how they called her a drama queen! Glad it's going well! Sounds like you found a wonderful teacher for your class. You made an excellent choice. When we took obedience classes at the SPCA, they set tables on their side to give each dog a place to relax behind a barrier so they weren't constantly stimulated by the sight of other dogs. It wasn't fool proof but it seemed to help. 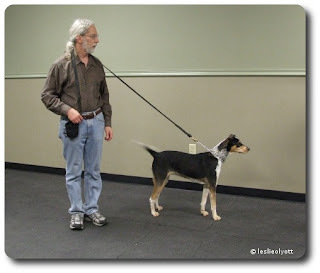 Hope you'll share about the agility class for reactive dogs. It's great you found such a thing. I bet Bella loves it. Yeah, the reactive dog classes we're taking are in a bigger space and they have blankets and fences they use to separate the dogs if necessary. I've found that very helpful. These initial classes were in much smaller rooms but also with mostly much smaller dogs since they were still basically puppies. Glad to hear your classes have helped you become less reactive. I don't think that's something that ever really gets 'cured' so much as 'managed'. Having folks that understand it and are willing to work with you on it is a really good thing. I hope someday you can find a class - I think they're becoming more common so you never know. 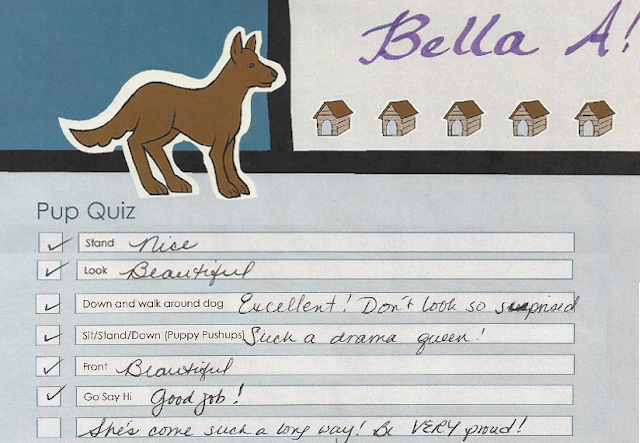 Yay for Bella! I'm glad to hear that the classes are going so well. Hi Pup Fan, thanks for your email address - I'm flat out this week but will drop you a note soon. Bella was just diagnosed, is on the meds and they seem to be working, I'm just looking for some personal insights from your experience - problems you've had, things to watch for or even if it's just been easy as pie to manage. That kind of stuff. Oh stop - your dogs are wonderful! this is such great news! yay for bella! this is also exactly why we were hesitant about taking desmond to a class setting--his leash reactivity is awful (we also have a copy of Feisty Fido, although mr. des has made no attempts to steal or eat it, unlike miss bella here). in fact, his training challenges are a big part of the reason i enrolled in school to become a certified dog trainer myself. i really felt that after paying a one-on-one trainer to come to our house and that going...not totally as planned, i couldn't justify spending any more money on training unless it was to become a trainer. i could start a new career, i could help desmond, i could help other dog owners, and i'd be able to train all the dogs i'll have in my lifetime without hassle. I think the decision to become a trainer is a good one if you have the interest and the opportunity. It's not for me (I'd happily work with dogs but trainers train people more than dogs and that's really not my thing ;) but I'm glad there are people willing to do it. It's become so important these days. Good luck with it. We are lucky to have a new and fairly fancy dog training center right in our town - I don't know why our town because we're nowhere important - with a bunch of different CPDT and Karen Pryor trainers. There are classes specifically for reactive dogs (Ruffians!) who can then go on to agility for reactive dogs. There are classes in Nose Work, regular agility courses, tracking and service dog classes. It's kind of crazy what we have available to us in dinky-town USA. ;) I have a post planned about these classes because they're really something special.